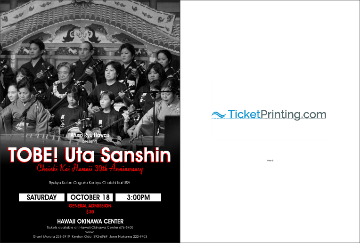 30th Anniversary Performance featuring the Afuso Ryu Koten Ongaku Kenkyu Choichi Kai USA, Hawaii Shibu. Under the direction of Grandmaster and National Living Treasure of Japan, Choichi Terukina, the Choichi Kai Hawaii has flourished and expanded from Oahu to Maui and Kauai and across the Pacific to Los Angeles. President and Artistic Director, Grant "Sandaa" Murata along with his students which include master instructors (shihan), licensed instructors (kyoshi), and certificate holders invite you to this anniversary celebration which will take the audience on a journey from classical Ryukyuan music to contemporary music. The performance also features special guests from Okinawa: Choichi Terukina Sensei, son Tomokuni Terukina Sensei, and grandsons Tomofumi and Ryuto Terukina. For those of you who have experienced them perform at the Japan National Theatre in Tokyo know that alone would be worth the cost of admission! Ticket information: General admission $30, ages 7 and under free. Hawaii Okinawa Center 676-5400 or Grant "Sandaa" Murata 808-256-5919, Kenton Odo 808-392-6969, June Nakama 808-223-9703 or any other Afuso Ryu Hawaii members.